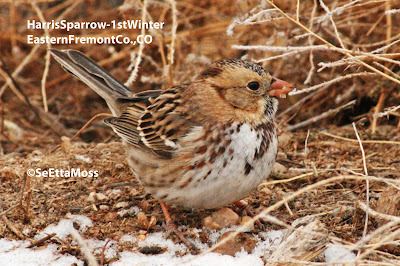 I found two 1st year Harris's Sparrows yesterday in a field just outside of Florence,CO (a little town not far from where I live). 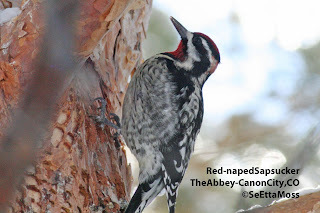 I spotted one perched in a shrub along with some White-crowned Sparrows. After a bit they flew across the road by a ditch and I found there were two Harris's Sparrows. I watched these birds for an hour and was surprised to see them, and the White-crowns, pick up what was presumably some edible seeds frequently. 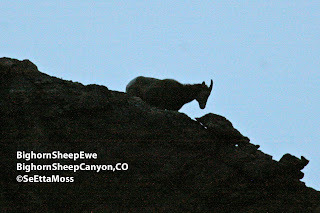 I guess this was a productive feeding location. 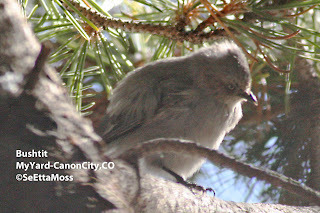 Before I was out of town for a month on my Rio Grande Valley trip there had been up to 23 sapsuckers wintering in the Canon City area. Since I returned home I have only been able to locate 11. 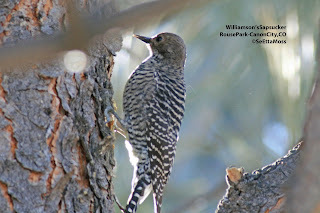 I took the top pic of a female Williamson's Sapsucker today at Rouse Park, a city-type park. 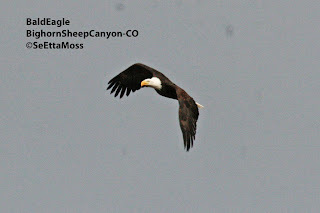 After viewing the Bald Eagles perched, flying or soaring above the Bighorn Sheep Canyon yesterday, I birded in Howard, CO, a small, spread-out town that spans the Arkansas River about an hour's drive west of Canon City. 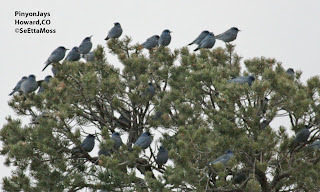 I found a flock of 75+ wandering Pinyon Jays. 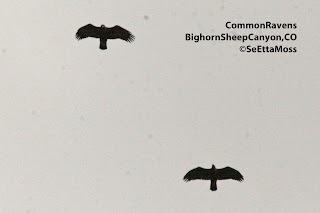 In these pics the Bald Eagle has gained altitude and is now more than 150 feet above me as it put on a nice show by soaring around at this lower elevation before joining the other two eagles that were much higher. 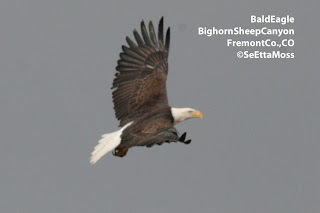 These pics follow the Bald Eagle after it lifted off and banked to fly downriver. 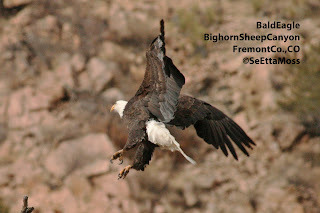 After keeping an eye, literally, on the birds overhead the Bald Eagle takes off from it's perch. What's flying high above the Bald Eagle?